Hot dogs are one food that I normally don’t crave come lunchtime since about the only offerings near where I work are the dirty water variety sold primarily to tourists. When I saw that Brooklyn Flea favorite Asiadog had opened a brick and mortar shop on Kenmare St. (btw. Mott & Mulberry) serving hot dogs, corn dogs and a few sandwiches and sides I knew that was I ever in the area I would be going there. Why? 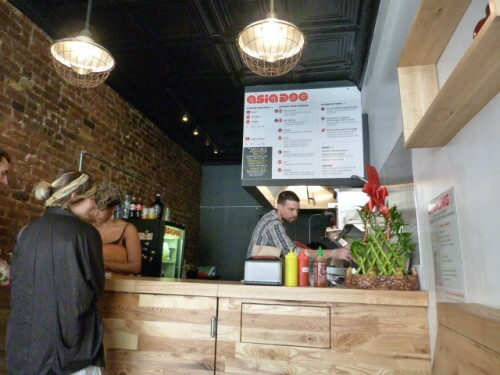 Because they have hot dogs topped with banh mi fixin’s, pork belly and potato chips, that’s why. It’s a tiny shop but if the two tables are full you can always take your food to the park up the street at Kenmare and Lafayette and eat in front of the mob waiting outside of La Esquina. 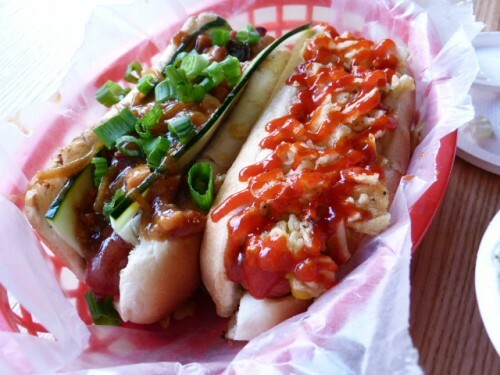 They have a bunch of different mix-and-match hot dog options along with a daily special, and they’re 2 for $8 or $4.50 apiece. There’s also a Korean BBQ bulgogi burger, pulled pork sandwich and kimchi pancake corndog. The day I was there the special was a fried chicken sandwich that one of the counter workers was eating and it looked kind of amazing and a decent size for its $7.50 price. 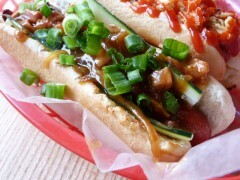 But I was there to eat hot dogs, and so I ordered a chicken one with the “wangding” topping of Chinese BBQ pork belly, cucumber and scallions, and a beef one topped with “mash” or sweet and spicy ketchup, jalapeno mustard and crushed potato chips. There’s also a veggie dog, but I didn’t even want to know what that involved. I liked the wangding topping with the chicken dog (on the left), which was surprisingly great and had just the right amount of pork belly. Both dogs have that somewhat snappy casing so it’s a little difficult to tell the difference between the beef and chicken varieties, especially with all of the toppings involved. 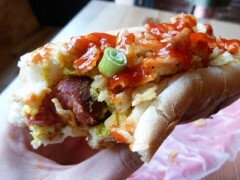 The beef dog with the mash topping was good, but perhaps only for the novelty of eating potato chips on a hot dog. 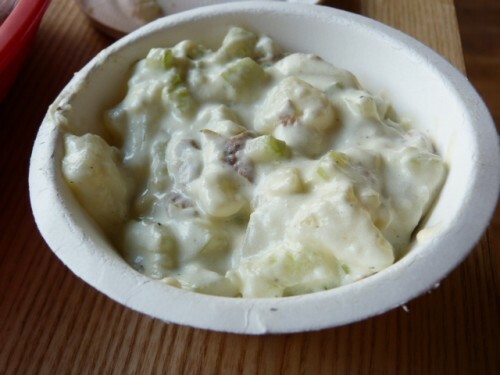 On a whim I also got a side of wasabi potato salad ($3) and wasn’t really a fan of it, but you might be if you like a lot of dressing on your potato salad. I’m glad I took a detour to eat here, and if you enjoy eating a hot dog on a steamy summer day you might want to head over if the La Esquina lines are too long. I like hot dogs served to me by hipsters. Anytime you top meat with another meat, I’m on board. Two hot dogs are not going to fill me up. And they’re $8. There’s not much seating and I hate eating at my desk. Posted by Andrea H at 12:00 pm, April 28th, 2011 under Asiadog, Nolita. It was pretty wonderful and also a nice change from the usual lunch options.I’m intrigued by the corn dog. On another one of my lazy walks through Chinatown, I see The Quickly on Pell Street has a Waffle Dog. This place used to be a gang hang out. I’ve eaten the waffle dog at Quickly. It’s strange. I loved it for the first half and then not so much the second half. The flavor combo is a weird mix of super sweet and meaty, but not quite working right. I’d still recommend trying it if you are curious though.